Rain alone will not clean your solar panels, just as rain will not clean your car. Professional cleaning of your solar panels ensures that they will function at their most optimum level of performance for years to come. While many homeowners have tackled the task of solar panel cleaning on their own, the benefits of professional solar panel cleaning are more significant than most would expect. 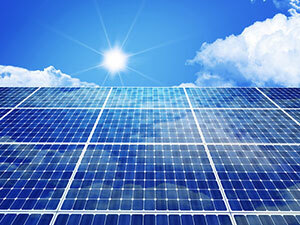 Solar panel systems are a big investment; keep it in good working order. A dirty solar panel can lose up to 40% of its efficiency just by being dirty. Call us today for a free quote, we offer one of cleanings and yearly scheduled maintenance. We are insured to protect the safety of your home and our workers. We guarantee that all of our solar panel cleaners are hired and trained directly by our company, so you will be satisfied with us every time! Our cleaning technicians are highly trained and only use OSHA compliant safety equipment for accessing roof top units. Using municipal or unfiltered water can leave hard water stains, and can also leave a film of soap which can actually aid in attracting dirt. Over time these impurities can bake into the glass and will require the use of an acid to remove from the glass surface. Our entire cleaning process varies depending on the degree of filth on the panels, but always ends with a purified water scrub to remove all contaminants on the glass surface for a long lasting clean. While this is a project that many homeowners attempt on their own, our professionals are often able to deliver results that are far superior, besides wouldn’t you rather be spending your weekends relaxing? Let the professionals at Northern Power Washing do the hard work, all you have to do is sit back and enjoy your professionally cleaned and efficient solar panels. Call us today and let our highly trained professionals do the dirty work.